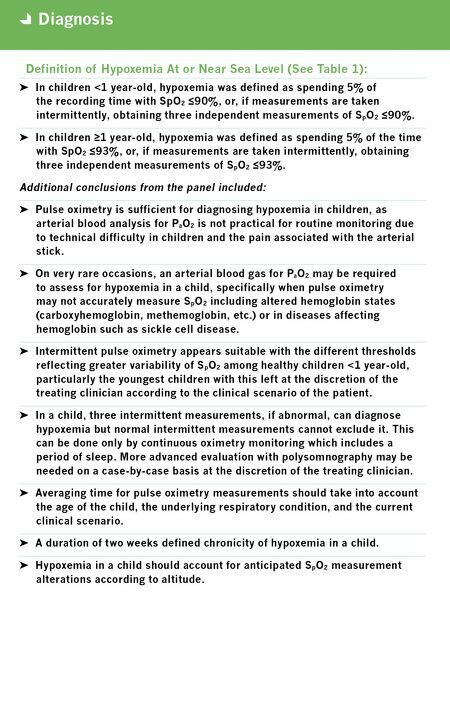 Key Points ➤ Home oxygen therapy (HOT) is used to maintain health due to clinical benefits in children with chronic lung and pulmonary vascular diseases. • Enabling a child to receive HOT also confers psychological advantages by allowing the child to remain within the family unit at home, reducing healthcare costs compared to hospitalization. ➤ Despite children having significantly different pulmonary physiology from adults and additional requirements for optimal lung growth and development, indications for funding HOT as determined by the Centers for Medicare & Medicaid Services (CMS) are the same for pediatric and adult patients. • These include: 1. P a O 2 <55 mmHg (<7.33 kPa), or 2. S p O 2 <88%, or 3. PaO 2 55–59 mmHg (7.33–7.87 kPa) or 4. S p O 2 89% accompanied by cor pulmonale, a hematocrit >55%, or a history of edema. 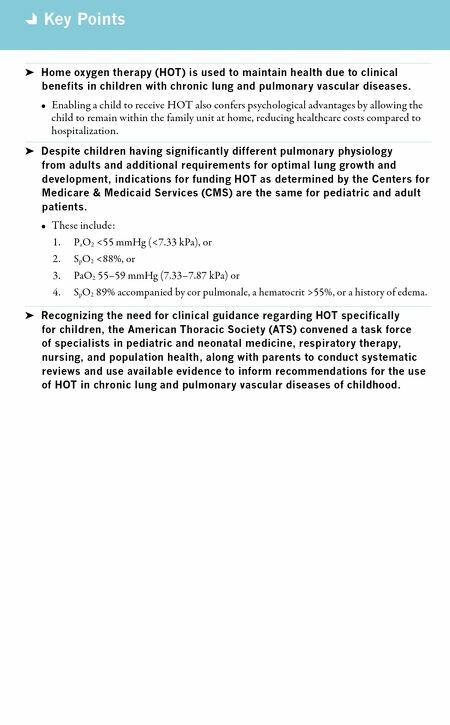 ➤ Recognizing the need for clinical guidance regarding HOT specifically for children, the American Thoracic Society (ATS) convened a task force of specialists in pediatric and neonatal medicine, respiratory therapy, nursing, and population health, along with parents to conduct systematic reviews and use available evidence to inform recommendations for the use of HOT in chronic lung and pulmonary vascular diseases of childhood.